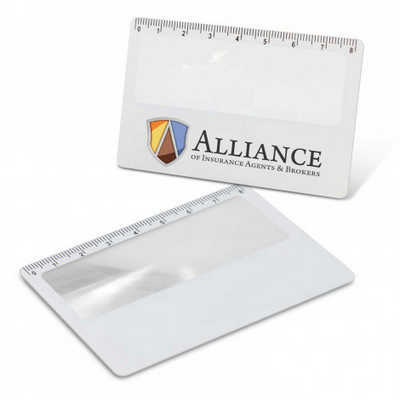 Handy credit card sized magnifier with an eight centimetre ruler on one edge. Colours: White. Dimension: W 85mm x L 56mm x 1mm. Print Description: 60mm x 15mm. Print Type: Pad Print. Packing: Loose packed. Price includes : 1 Col 1 Pos Print Setup is included.